The famous idea of working in your hoodie and sweats often leads people to believe that it’s a breeze to clock in the same hours you normally would in a cubicle. However, there are so many temptations that can disrupt your workflow in your home nook: the premiere of your favourite TV show, the slew of social media notifications that pop up every few minutes, and the cravings that inevitably kick in as soon as you enter your work mode. Before you abandon your dream of working from home, there’s so much you can do to make sure that your productivity flourishes and that you make the most of your designated home office. If you spend most of your time looking for a contract or a brochure, or you cannot find your external hard drive or your flash drive, you’re most likely wasting invaluable hours every day. Before you move on to other design details, make sure you do a bit of spring cleaning to rid your home office of all the items you don’t use. Then, organize your space in such a manner that you can always find precisely what you need. This is where minimalism steals the spotlight as one of the best approaches to organizing your desk and your computer – less is more, all you need to do is use it wisely. 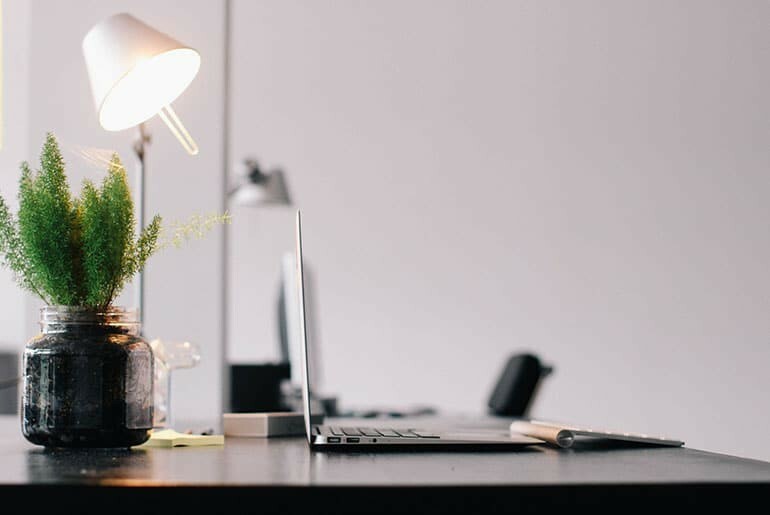 With a clear, neat desk in front of you, you may enjoy the crisp white glow in the first several hours, but your motivation will quickly dwindle. This is why you need to give your space a personal touch, with a few hand-picked posters as well as photos of you and your loved ones, or a mug with a goofy or a motivational quote to start the day right. Add a few certificates or diplomas onto your wall so that you remind yourself of your previous accomplishments and add a professional note to your image. This will make your home office more appealing if you decide to start taking client appointments in your home. Can anything make your little work nook more inviting than the fragrance of your morning cup of joe? The very scent of coffee gets your senses inspired, and as you start sipping, your brain and your body will wake up, brimming with energy. Coffee is a known productivity-booster, making it a perfect start to your work day. That said, you can invest in a Nespresso machine to empower your office with your own little caffeine supply so that you can kick off your early morning projects with true gusto. Keep it on a separate table next to your workstation, and you’ll be eager to pop by your work corner as soon as you open your eyes. In addition to functional elements of your home office, you should also consider the ones that will not only affect your productivity, but also your well-being. The three pillars of a healthy work environment include the lighting, clean air, and proper, ergonomic furnishing. First of all, if you have the option, you should aim for creating your office in an area of your home that gets plenty of natural daylight. That way, you will avoid feeling drowsy, sluggish, and prevent eyestrain from poor lighting. Then again, if you’re a night owl, you should consider adding high-quality LED lights for your workstation. As for fresh air, high levels of pollution may make it uncomfortable to work with your windows open, because of all the traffic noise and the exhaust fumes, which is why you might want to consider introducing a quality air purifier. Finally, an ergonomic chair and a desk of suitable height are both a must for giving your proper lumbar and neck support. Plants can cheer up even the dullest of spaces, and not to mention their perks of helping keep your air clean and your workspace more inspiring. The very colour of your plants gives your brain a boost to work more efficiently, while different, low-maintenance plants will not take too much of your time while elevating the look and feel of your office instantly. Greenery is known to reduce stress levels, turning your office into a serene oasis where you’ll look forward to conducting all those brainstorming sessions and pitching your potential clients. With decreased stress, you can also expect your focus to improve, thus letting you spend more time truly working, and not wasting your hours procrastinating. Finally, it’s vital that you make sure all those notifications are filtered so that you don’t waste your time and energy of meaningless tasks and checking emails all day long. In fact, having a structured schedule will help you have a designated timeslot for handling emails, while the remainder of your day will be reserved for various tasks and assignments. You can use different desktop apps such as Freedom or Anti-Social to limit your social media time and remove access to the websites you know you’ll spend too much time perusing (think: BuzzFeed, Instagram and Facebook). With a bit of creativity and dedication, you can transform just another corner of your home into a true workstation that will inspire hours of brilliant work and help your career soar to new heights – even in your sweats and your hoodie!